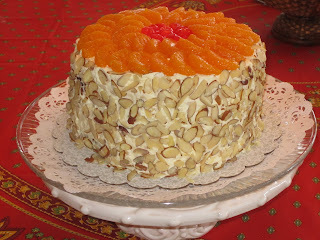 Optional: Extra whole Mandarin oranges and dry cherries for garnish, also 1-2 cups of sliced almonds, patted on the sides. Preheat oven to 325 for dark or non-stick pans. Grease and flour 3 eight inch cake pans (can use Pam spray for baking). Mix cake mix, Mandarine Oranges with juice, eggs, walnuts and oil until oranges are broken and mixture is fluffy, beat about 2 minutes. Divide into 3 pans. Bake at 325 degrees for 30 minutes or until a toothpick inserted in the middle comes out clean. Set aside to cool on cooling rack. Mix pineapple, Cool Whip, zest and pudding until fluffy. Frost between layers, sides and top. Optional: You can garnish with circles of Mandarine Oranges and dry cherries in the center and sliced Almonds patted on the sides. This makes for a beautiful cake!